Urumqi is the capital of Xinjiang and also one of the biggest city in this region. It is the major hub for ancient Silk Road during the Tang Dynasty. 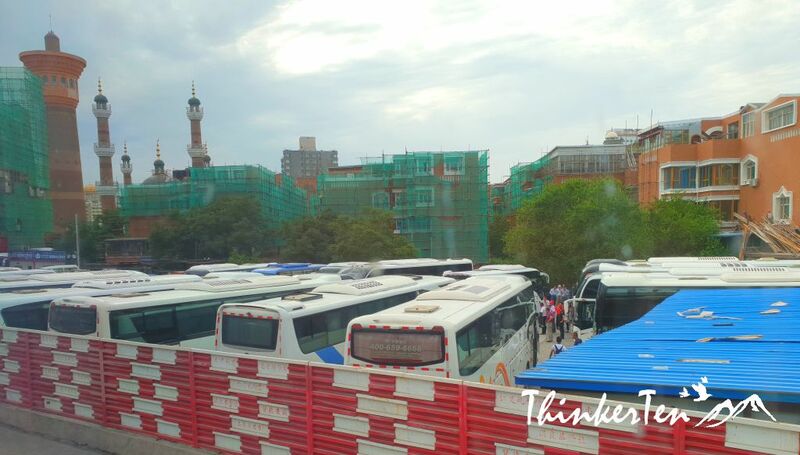 When our bus entered the city of Urumqi, that is when the traffic jam started. 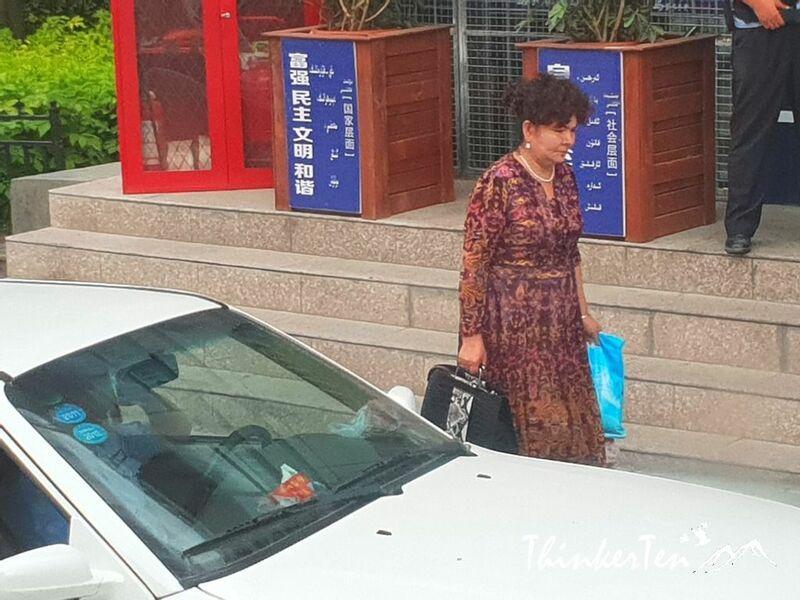 Moving from one place to another aren’t smooth as compared to outskirt of Urumqi. You also notice the parking can be a headache here. When our bus approached the International Grand Bazaar, we saw the parking space was already full of tourists’ buses. (Picture below). As usual security is tight and police officers can be seen in all corners. There are also security metal detectors when you enter the bazaar. 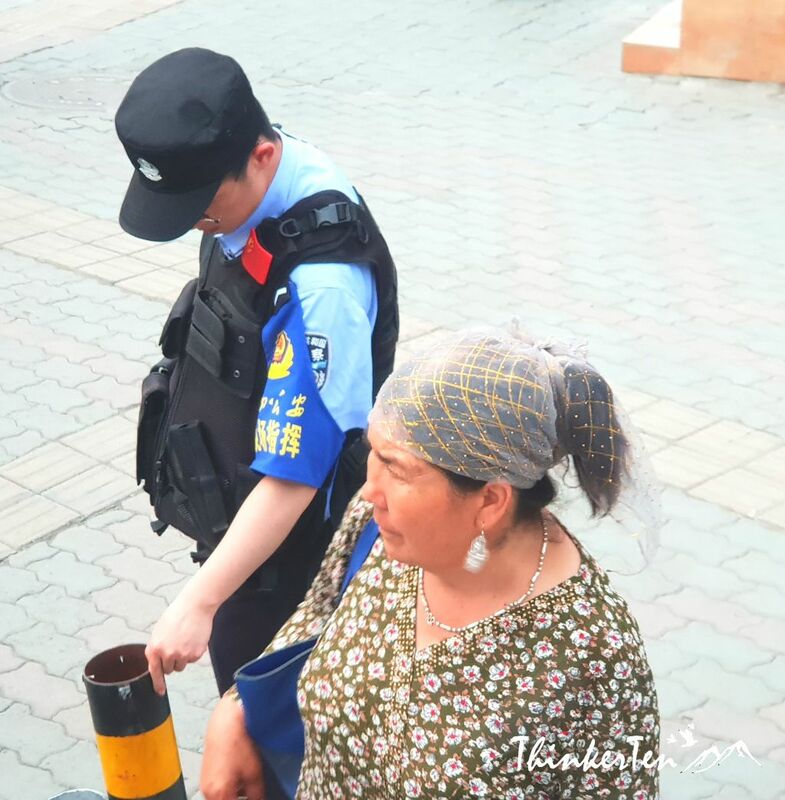 Well, this is a norm in Xinjiang, security metal protector is installed everywhere; at the entrance of the restaurant, department store or even public toilet. I see local has no complaints on these security measures and get to it. Many Uyghur faces can be seen when you are near Grand Bazaar Urumqi. 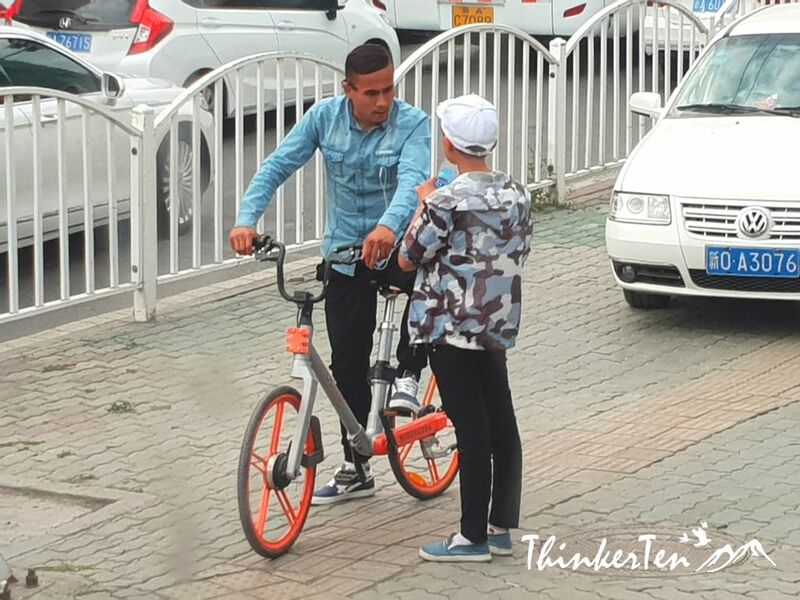 Uyghur consist of huge population here in Xinjiang. They have been called ‘people of the bazaar.’ For centruries the Uyghurs were famous as traders and money changers during the ancient Silk Road period. 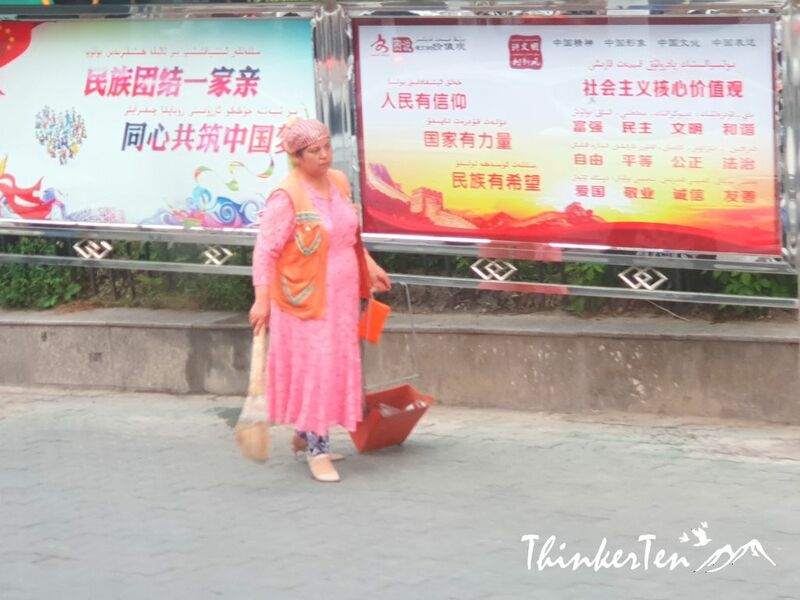 Uyghur lady making sure the place is clean by sweeping the floor in front of the Chinese propaganda. 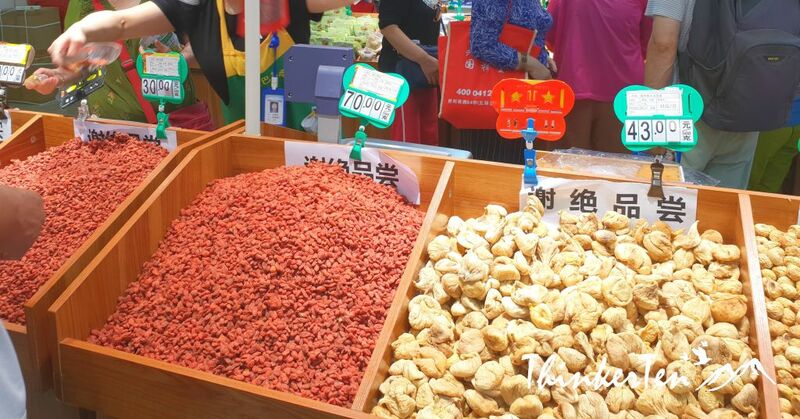 One of the top attraction in Urumqi is the International Grand Bazaar. 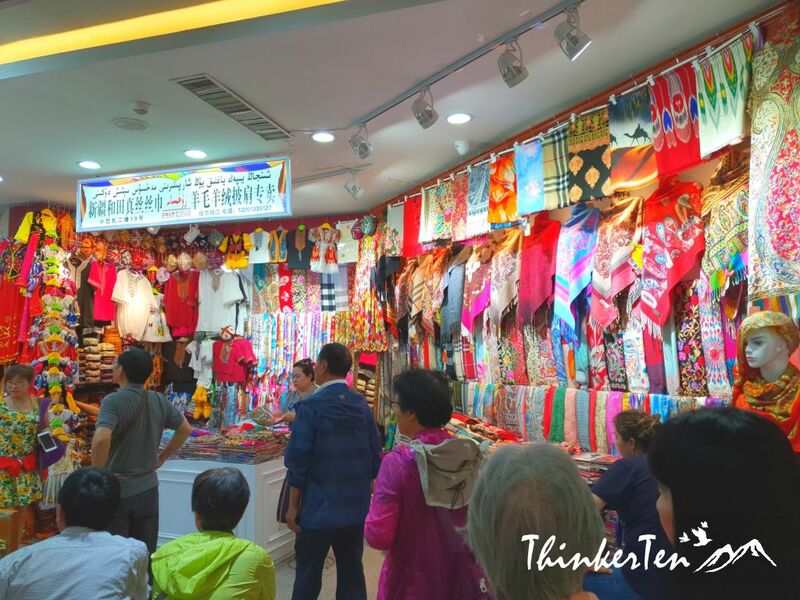 There are over 3000 booths in Xinjiang International Grand Bazaar selling all sorts of things such as scarfs, colorful clothing, potteries, jewellery, nuts, fruit, carpet, lotion & soaps and many more. Since there are so many things to choose from, I have narrowed down the top 10 things you should buy or eat here. 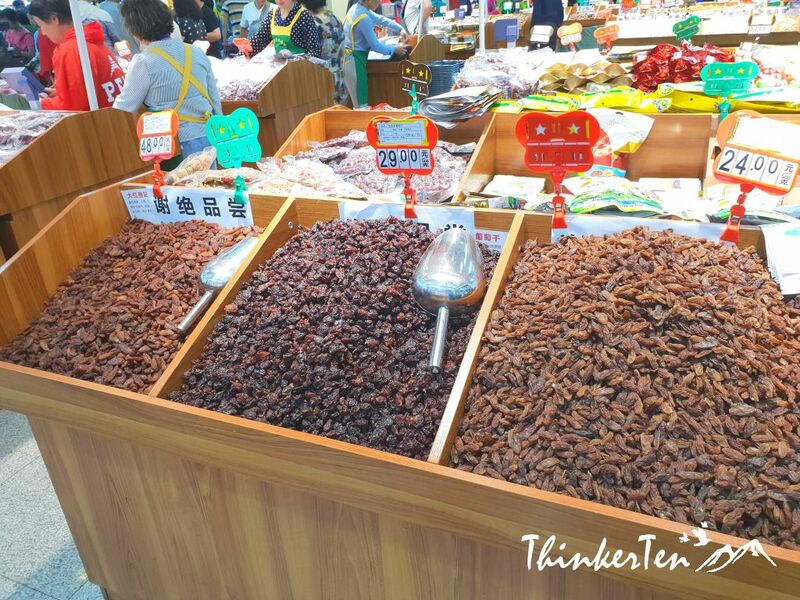 All type of dried raisin in different size and colors are sold here, My favorite would be the iconic ‘grandfather and grandmother’ of raisin. No tasting are allowed written in Chinese beside the price tag. Grandfather & grandmother raisin are being called because of the giant size of the raisin. They tasted very sweet and considered the top grade, hence is being crowned as “Grandfather & Grandmother” as these are the respected words used in China. Have you ever tried dates & walnut being eaten together? This is one of the specialty in Xinjiang. It is healthy as it has no added sugar and red dates are good for enriching the blood while the walnuts are nutrient rich food for brain. What a smart way to eat two together. You will notice the walnut is being sandwich in between the red date, quite a unique presentation. 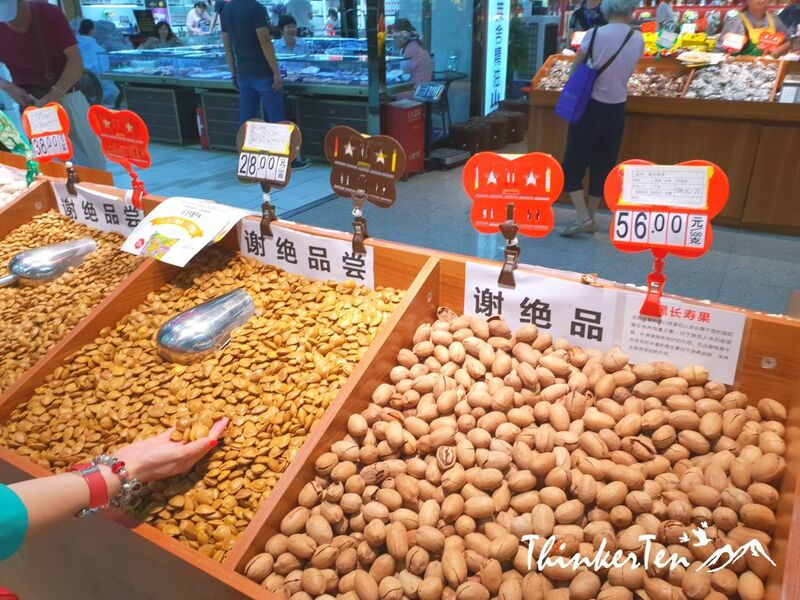 Another thing you will find in all over here is the nuts and there are various type of nuts available. The walnut tasted very fresh as it is still in the shell. There are different size of walnut and the bigger one cost more. 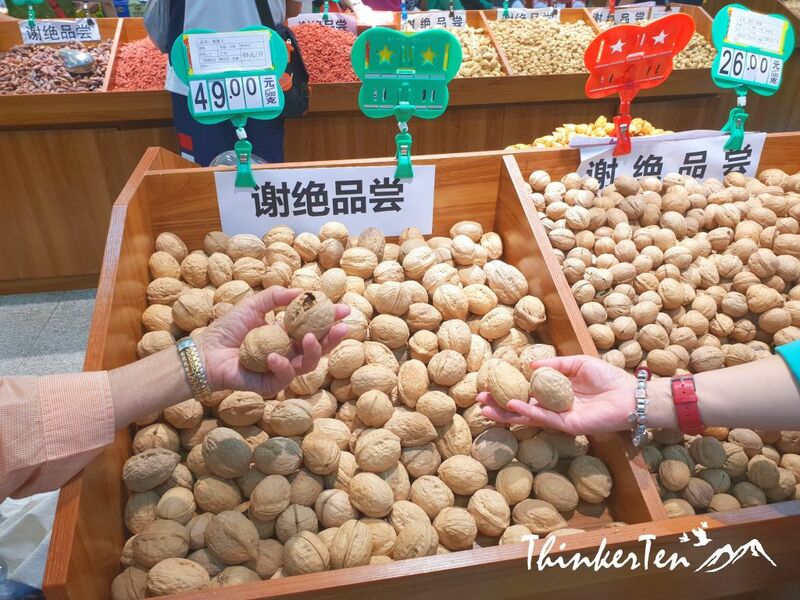 I strongly suggest you to bring some walnuts in shell back home to Singapore as ours sold aren’t as fresh and usually without the shell. Wolfberries is another top-selling item here. Chinese Wolfberries are believed to be good for vision. Eat everyday to combat those tired eyes from reading too much phone and electronics tablets. Xinjiang Milk tablets are candy loaded with calcium for children and pregnant mommy. 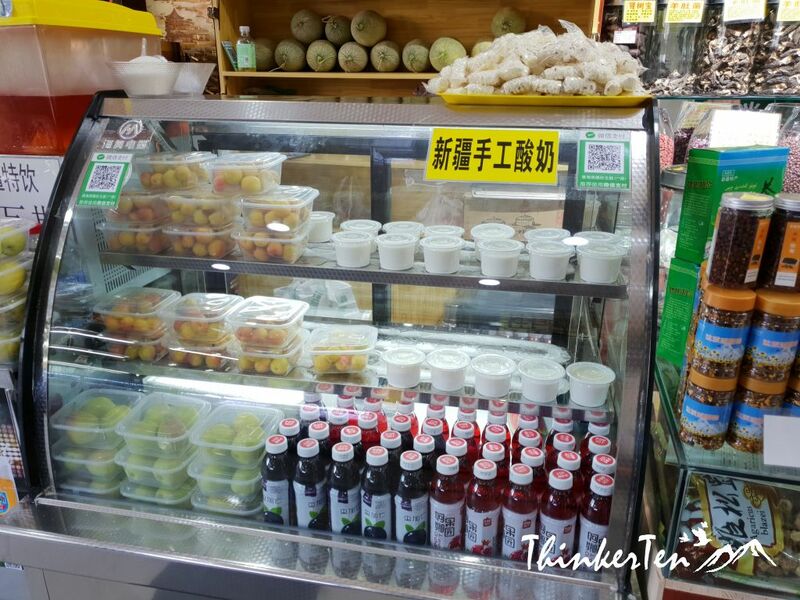 Hami melon is originated from Hami, Xinjiang so it is not surprise that they can be found in Grand Bazaar here. 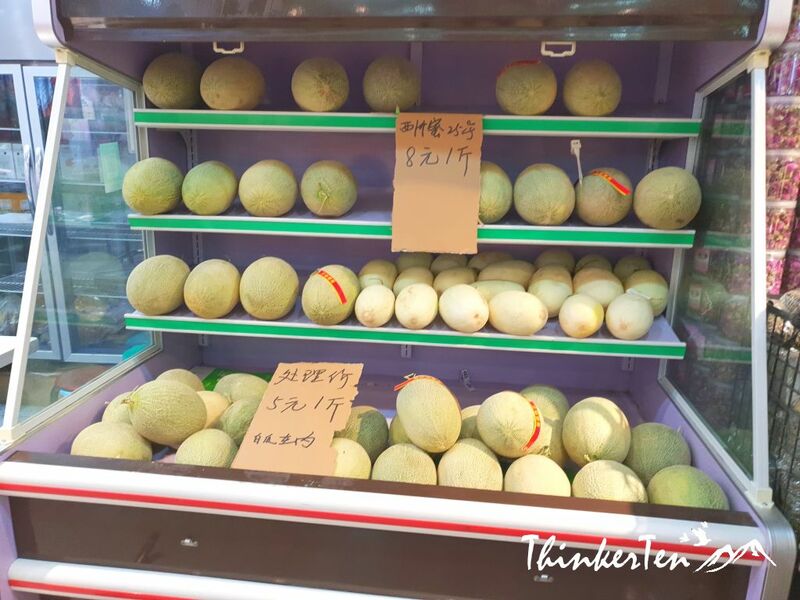 The fresh Hami melon is best to eat in Xinjiang and not to bring home in the flight. 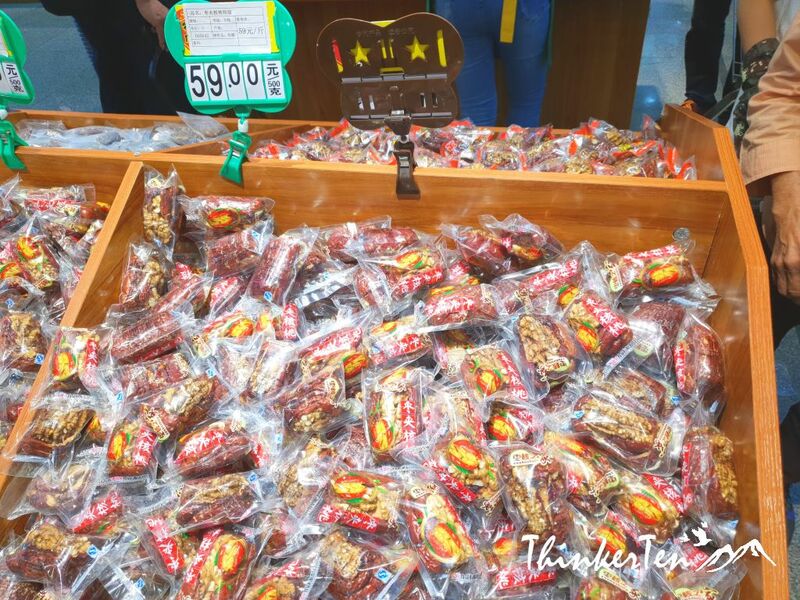 But there are also dried hami melon pack in nice packaging for you to bring back as souvenirs. 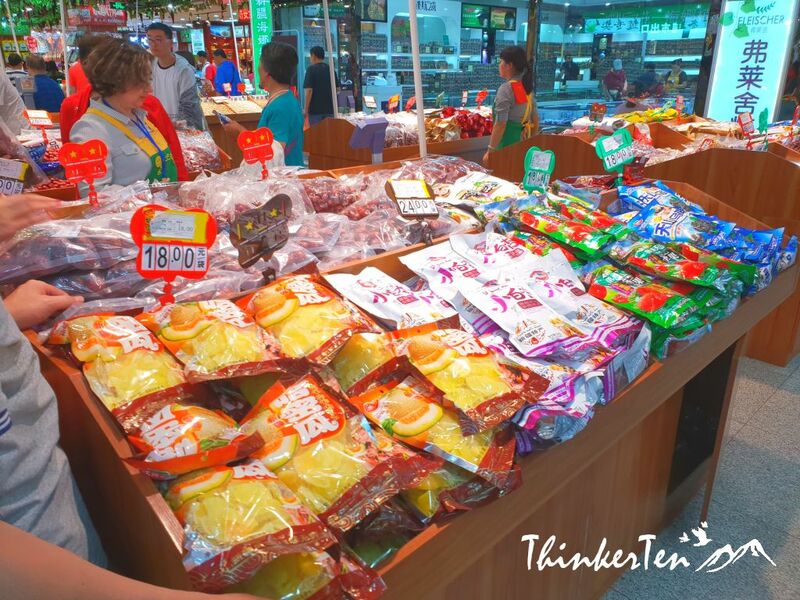 I tried the dried hami melon and it tasted good and sweet, also easier to pack in the luggage. Xinjiang Ili which is 10 hours drive from Urumqi is famous for it lavender farm in summer (June onwards)so if you are essential oil lover, you can bring some back home some of these Lavender oil. 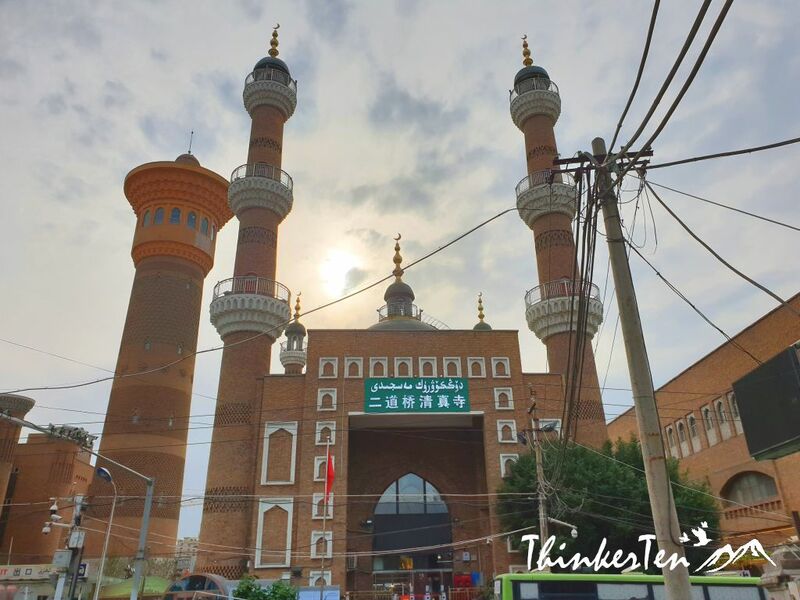 Too bad I didn’t explore Ili this time, Ili is another must visit destination in Xinjiang. You can also find horse oil in Xinjiang, not just in Hokkaido Japan. Horse oil was used as a folk medicine in ancient time. If you have burns, insects bites, cuts or hair loss, just apply horse oil and it will absorbed by the skin and safe for people all ages, even for baby. The oil is derived from the fat of horses and the fatty acid of horse oil is very similar to human sebum, making the oil able to deeply penetrate the skin without feeling greasy. You see yogurt drinks sold in most of the attractions, people here love yogurt. The appearance is white and tastes mellow and smooth and you should give it a go. Don’t be afraid of the ingredient as the local Uyghur used the cattle milk as fresh raw material. The naan bread here is different from our roti prata / roti canai or Indian naan. Some of the naan can be very thick and hard to bite, you may have to dip it in the tea to make it soft before you eat it. Go for the thin version of naan as it suit foreigner taste more, slightly salty and topple with sesame. Dutar – A super long necked plucked lute with two nylon. If you are lucky you can hear the owner playing for you in front of the shop with these traditional instruments. One of the interesting sights was the Middle Eastern architecture, a beautiful Mosque situated in the middle of the Grand Bazaar. The minarets look stunning standing tall and make a great landscape. 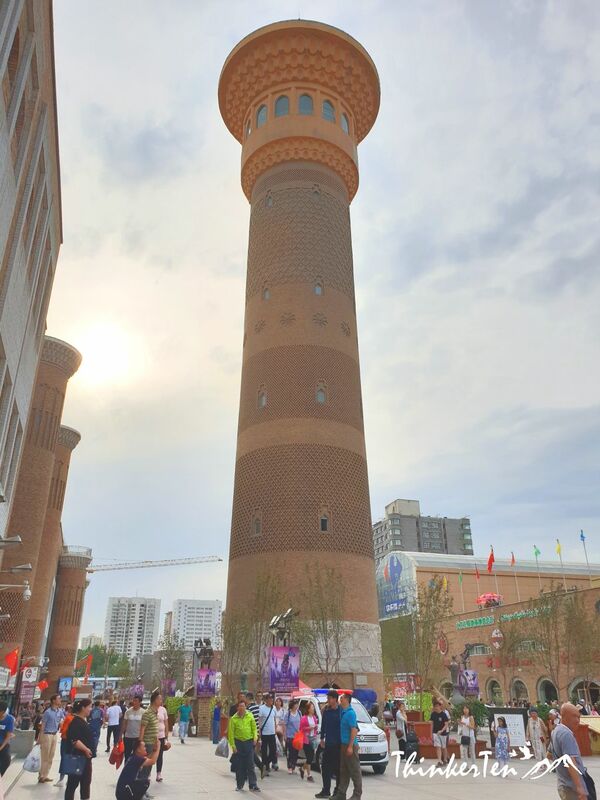 The Urumqi Grand Bazaar is similar to the Istanbul Marrakech Bazaar. 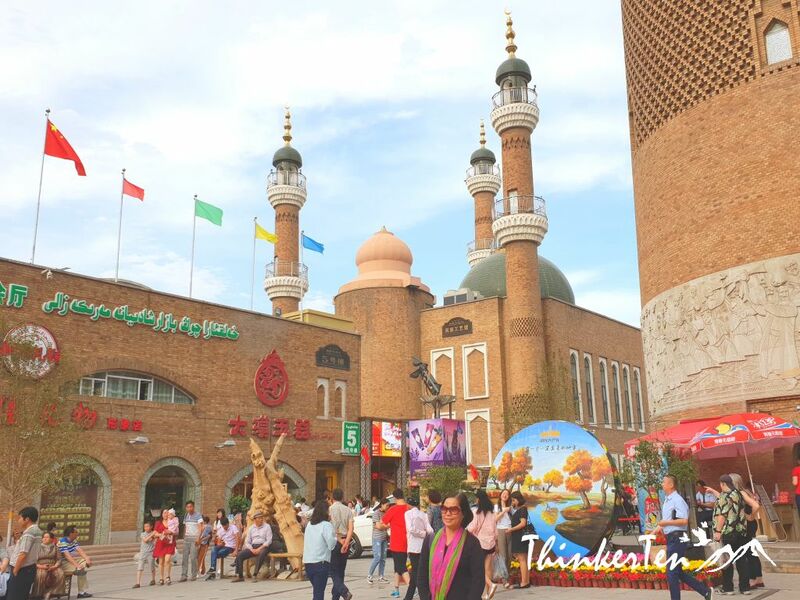 The good thing to explore Urumqi International Grand Bazaar is you get to see everything here. Great place for to get your exotic souvenirs back home. The shops are quite repetitive and selling the same stuff everywhere. 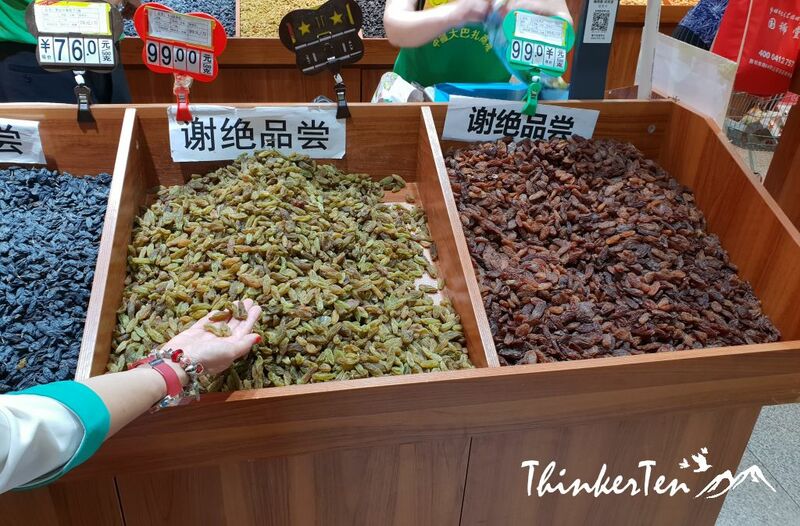 I find the things sold here are more expensive than other places in Xinjiang, such as Turpan. I suggest you to start getting your souvenirs during your tour in Xinjiang and don’t wait for your last stop in Urumqi. 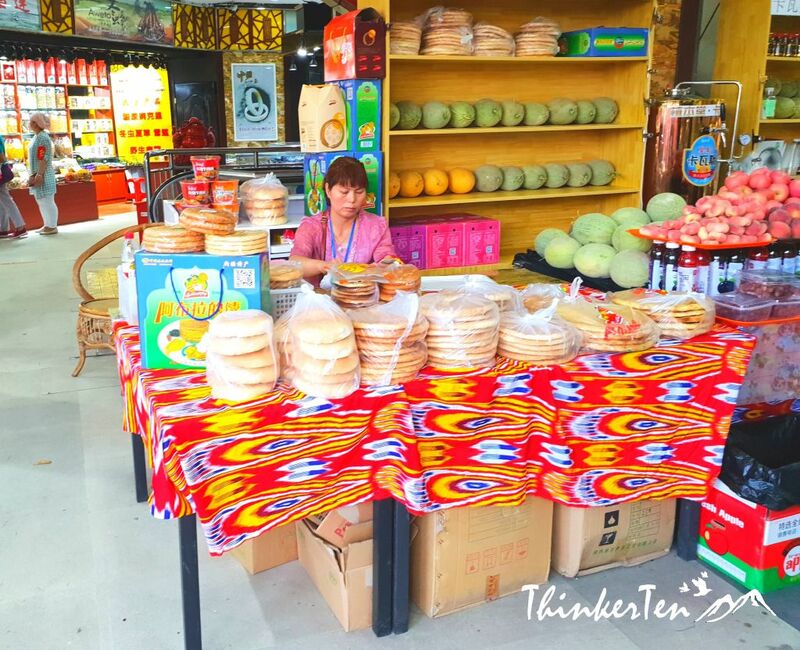 If you missed out the souvenirs you wanted to buy during your trip in Xinjiang, you can always buy it here, just that the price may cost higher. Urumqi usually is the last stop before tourists depart back home. That is absolutely fantastic! I love bazaars and markets like that. I always look for them when I travel. 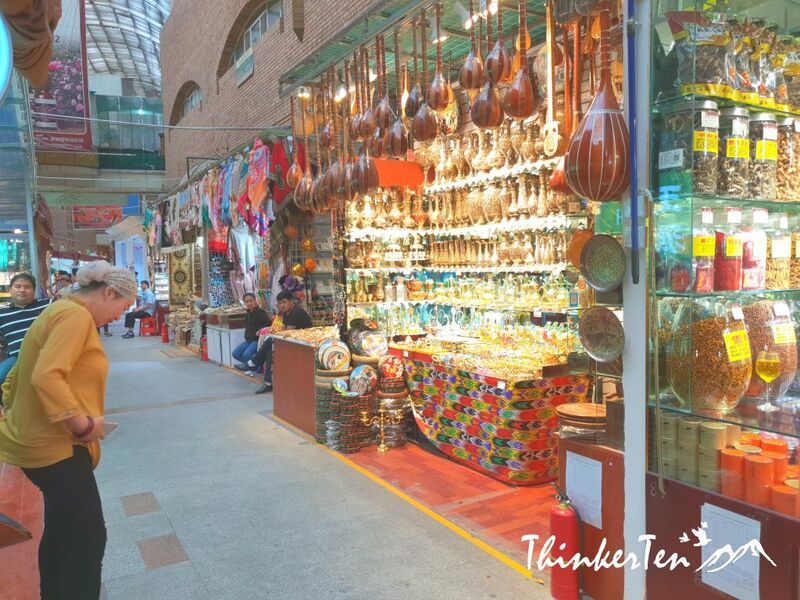 International Grand Bazaar in Urumqi Xinjiang is the place to shop for all the souvenirs that you didnt get during your trip in Xinjiang. The price can be slighly higher compared to other attractions but many tourists still prefer to shop here as it has almost everywehere. Looks like an enjoyable trip. I’d love to try those walnuts. We dont usually found walnuts in shell back in my country so this is great stuff to bring back home. I loved reading your post! I hope to experience the Grand Bazaar one day myself. Thanks for sharing! I love experiencing other cultures and what better way to do that than visiting a Grand Bazaar of that country. China seems to have a lot of goodies. Thank you for sharing! 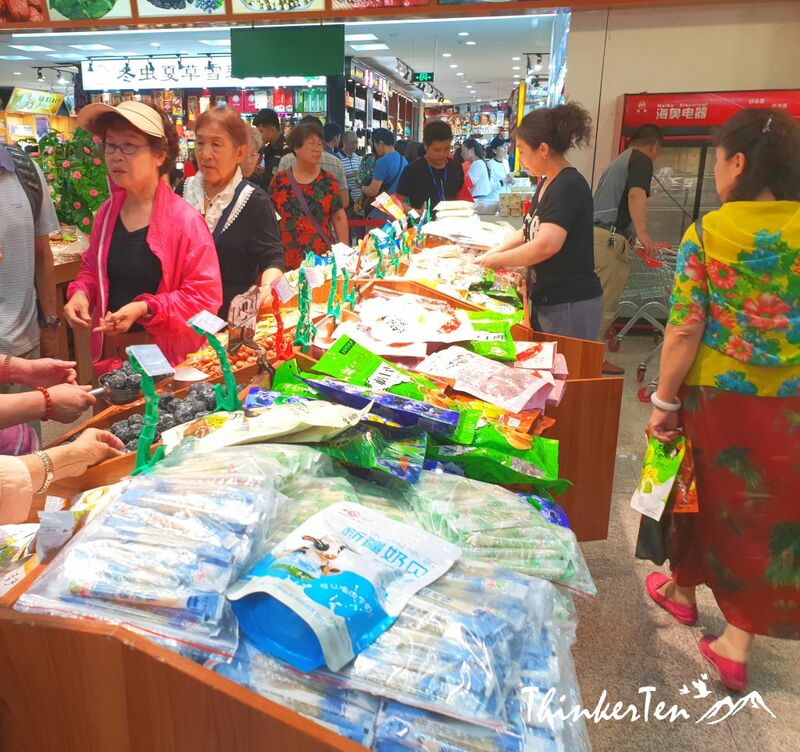 Visiting the Grand Bazaar International Urumqi can be a lot of fun but many shops are selling things that are repetititve. But still no harm to pay a visit here for a few hours. So many goodies, so little time! The walnuts look like the ones my father-in-law used to harvest in the fall. Memories! Great to learn that where you stayed grow so many walnuts! We don’t walnuts tree from where I live so seeing such huge walnuts with shell is something special to me. The walnuts sold here usually are without shells. I’ve never been to China, but I do have a bucket list, so I’m definitely adding this place! China is full of exotic and pack with new experience even for people like me who lives in Asia and having a Chinese background. Higly recommend anyone to pay a visit if you love culture and scenery. I love naan (and Roti, how can you not). That marketplace looks fantastic! The naan is one of the signature in Xinjiang. They do it slightly different but tasted as good. I would prefer the thin version and could not enjoy the thick version. We love visiting bazaars when we travel. This one is huge, love the big walnuts! Walnuts is great for health and I usually took them together with my oats in the morning. Just strolling in these alley make me feel happy and pretty interesting to see the thing displayed here. Highly recommended to do if you happen to be in Urumqi Xinjiang. I’ve never been to China before, but it sounds like an interesting place to visit. Love all the things and pictures you’ve shared. China is so big and Xinjiang is more for advance China traveller, meaning those who have been to China several times. People usually start with Shanghai (to see hundred years history of China), Beijing ( to see thousand years history of China) and Xi’an (to see 5000 years of China ). For Xinjiang is more of scnenery, ethnic groups and a taste of Central Asia elements in China. I love finding little gems when traveling. 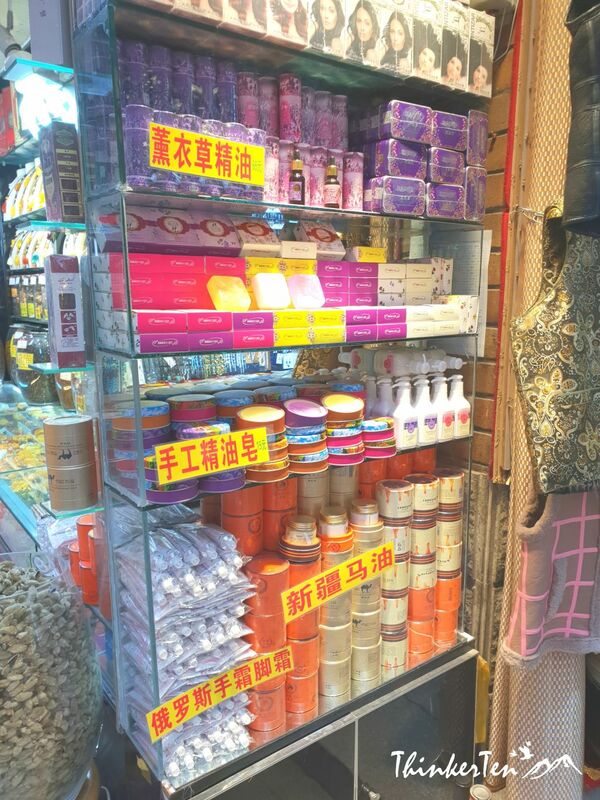 You will find a lot of intersting stuff in the Urumqi International Grand Bazaar here.